Conductix-Wampfler has been refining its high quality, state of the art and patented fibre optic rotary joint used in cable reels. 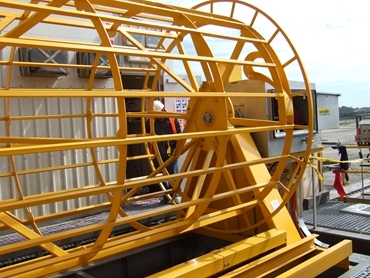 Conductix-Wampfler is one of Australia’s largest manufacturers of cable and hose reels used to supply power and control to mining stackers and reclaimers. Recent projects include stackers and reclaimers at Dalrymple Bay Coal Terminal, Abbot Point and Worsley Alumina. All of these machines make use of electrical cables which incorporate fibre optic elements. negligible losses are incurred thanks to the fibre optic rotary joint's operation through a continuous cable. Conductix-Wampfler fibre optic rotary joints have been chosen by some of Australia's largest mining companies in recent applications, with numerous reliable operations now present nationwide.